For me, one word: Fanfiction. A few months back, Roadtrip Wed at the YA Highway asked to see our teen writing--and not our writing about teens, but our writing when we WERE teens. I got a lot of lol's and people telling me how awesome I was for writing in the world of Harry Potter and World of Warcraft. Now, my love for writing and books extends WAY before Harry Potter. I've been reading since I was six, running up to my mom when I read the word 'The' (no joke!) all by myself. I memorized this dinosaur pop-up book from making my mom read it to me every night. I have no idea where that book is now (though I have my suspicions that it may have been involved in voodoo rituals and lots of fire...Just kidding, Mom. Kinda) but since I was just a tiny little thing, I loved books. So naturally, it was only a matter of time before my love for reading evolved into a love of writing. I remember the first story I had ever created. After reading Hero with a Thousand Faces at the age of 10, I wanted to write my own story, and even back then, I was a little fangirl for fantasy. Epic fantasy to be exact. The story I conjured was about a mistreated girl who was the daughter of a king. She wasn't a princess however because she had inherited magic from her mother who was a sorceress, and in her father's kingdom, magic was outlawed. But when her sister falls ill and the only cure comes from the petals of a Fire Rose several lands away, only she has the ability to save her. Insert mentor to nudge her on the right path, a cute sidekick with the ability to control the elements, and an evil wizard plotting to stop the MCs quest so that her sister's death would cause a war between nations, and you've got a MG book on your hands. See, I was such a rockstar at 10. But I never got around to writing it. Something else popped up that had be in a hype. It was called fanfiction, and it was heroin to my 11-year-old brain. Harry Potter was the one to get me started. During the withdrawls (AKA time between HP books), I had to find some other way to lessen the pain, which lead me to the site Fiction Alley. I read them, I wrote them, I virtually stalked fanartists--the site was the Disneyland of HP fanfiction. Even famous authors wrote there, like Cassandra Clare, who was known by every HP fanfic fan around the world. So what about you. When did YOU realize your love of writing? What was the first idea you had and how old? 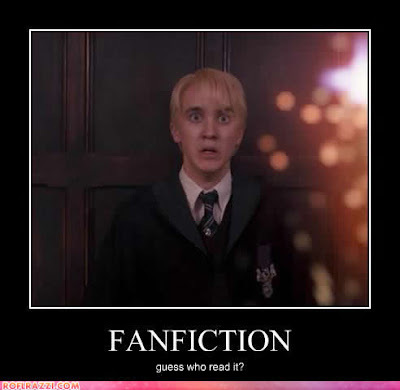 That picture of Draco is epic. D-bag guys: Are they a turn off?